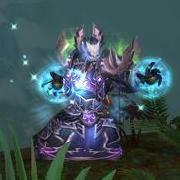 This thread is about comments on our Witch Doctor Firebats build with Legacy of Nightmares. I've been using this build on my WD but I've also seen a very similar build where the Gargantuan is used instead of the zombie dog, using the short mans finger. After testing them a bit it feels like the zombie dog build ends up doing more dmg, but considering a lot of WDs are using the Gargantuan build instead, that makes me think the Gargantuan build is stronger. What are your thoughts? This build makes me feel like a noob. I couldn't even do GR 50 with it, as it's so reliant on BBV. I understand that Starmetal Kukri can reduce the cooldown of BBV, but what I don't understand is how SMK even has a place in this build. Where are the fetishes? And why do we want Haunt% on our offhand? What the hell am I missing here? A large amount of Ancient Items for the set bonus. Still doesn't explain to me the SMK/Haunt additions, but at least I know where my brain fart was at. The SMK greatly reduces BBV, so that would be why that's included. Unless I'm also missing something, the haunt % appears to be an error. Just substitute that with one of the other skill damages included in the build, and you should be GTG. I understand what SMK is supposed to do. I didn't see where the fetishes were coming from ... The only piece I hadn't found was the belt, which is of course the only source of fetishes in this build, and I was overlooking that. This build is very effective but also very boring. I'm currently doing lvl 50 grifts and it's pretty much a breeze (especially in terms of resilience) and I only have like 2 ancient items and no Starmetal Kukri yet. I also found it's way better to use "The Grin Reaper" in armor slot instead of Krelm's buff bracers", at least with only 2 ancient items. The xtra dmg far outweighs the occasional stuns and knockbacks. Stuns and knockbacks interrupt your channeling. At lower levels, this may not be a big deal, in which case Grin Reaper might be better. At high levels, however, it will kill you because of how much healing and damage mitigation are tied to maintaining that channel. Even when it doesn't kill you, it drops your damage because Firebats (with that rune) takes three seconds to reach full damage. I will be reviewing all missed/non-answered comments and answering them, as well as passing on any information. I will also be archiving any older threads that are no longer relevant to our current displayed guides. Threads that are staying will be renamed to better fit the guide they are actually being used as a feedback section for, since some names are heavily outdated. Please bear with me while I work my way through all the threads. Thanks for your patience!